Children’s artwork and poetry highlight the history and vitality of their river town. 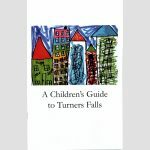 Take a tour of Turners Falls through the colorful pages of this whimsical booklet and discover intriguing facts about the town’s industry, culture and wildlife. The 28-page full-color booklet is available for $5.00 from the CRC Store. Order Here. Created by the children of Gill-Montague Elementary Schools, working with Nancy Meagher in Art classes and Carol Berner in Poetry Workshops. Many thanks to the Town of Montague for their support which made printing this book possible.